While a good diet, herbal remedies and supplementation go a long way to prevent illness, we do stress that if your pet is in discomfort, pain or presenting with symptoms, your first obligation is to seek veterinary advice and treatment particularly for acute conditions. There are times when you might like to use herbal remedies. If you do, however, always check with your vet if you plan to administer herbal extracts with veterinary medication. A point worth noting is that human medicines should not be administered to your pets. The following topics will be covered under the “Conditions” section. Arthritis, particularly in older pets and those that have suffered trauma injury leading to chronic pain. Kidney Health and ways we can avoid some of the kidney problems associated with age. Skin Conditions, in particular flea related irritations. Cancers and some of the dietary changes we can make to help either avoid the disease or provide complementary help alongside veterinary treatment. Ear health, smelly ears and ways to address mites in ears. Behavioural problems, in particular compulsive repetitive behaviour, nervousness, persistent barking, territorial marking in doors. Endocrine problems often seen in cats ie over active thyroid. 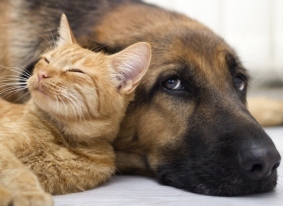 Diabetes and/or insulin resistance in both cats and dogs. Obesity in cats and dogs.